By taking accredited high school courses through The Tutoring School, students can experience the benefits of flexible, individualized instruction, while also earning credits toward graduation. Credits for our semi-private and private classes are granted by The Beekman School – an accredited high school in New York City. Tutoring School teachers provide personalized instruction to those students who are seeking full or partial course credits in a broad range of subjects. Accredited online and classroom programs also assist students who are following a personalized education plan with the goal of an early graduation. 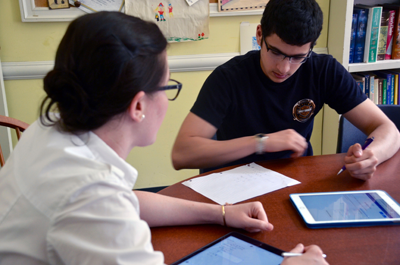 By completing high school courses through both The Beekman School and its tutoring program, students can often graduate in less than four years or catch up on missing credits to graduate on time. Even students who are not currently attending Beekman are welcome to enroll in the Tutoring School’s for-credit courses. Learners often advance their educations by taking classes, including science labs, which may not be available at their current school. Want to find more information about all The Tutoring School offer? Contact us today. We facilitate learning by providing accredited course offerings and supplemental tutoring services. With dedicated teachers and high educational standards, The Tutoring School is one of the best accredited online schools for the non-traditional student. We allow learners to enroll in accredited online high school courses throughout the year. Students then have the flexibility to complete coursework in a variety of locations and during a range of times. In addition to credit-based classes, supplemental tutoring and test preparation programs are available. One-on-one sessions with a tutor can enhance knowledge initially gained in the classroom or through homeschooling. From preparing for final exams to completing an English course, discover how you can receive valuable support for educational achievement through the Tutoring School.